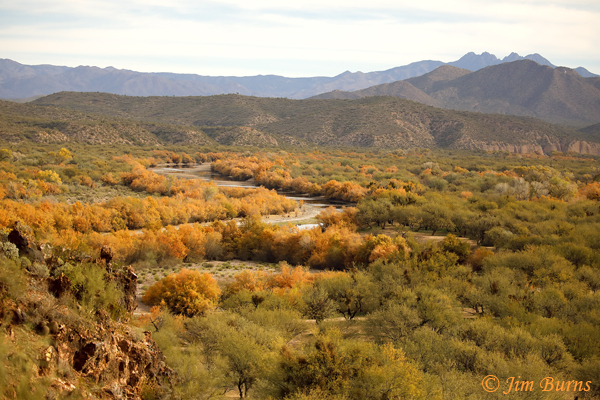 A ribbon of riparian color, the leftover ambers, umbers, and golds of autumn, runs along the river as it wends its way, circuitously, from Four Peaks. Behind me, downriver, is the north wall of Granite Reef, a tapestry of dull reds and greens on this day when the sun is losing its battle with overcast. A stiff breeze blows out of the northeast, buffeting the façade of the cliff on which I stand. It won’t be long now. I’ve climbed this bluff before, hoping a photographic image which exists only in my mind might come to fruition. The resident Bald Eagles course this river. 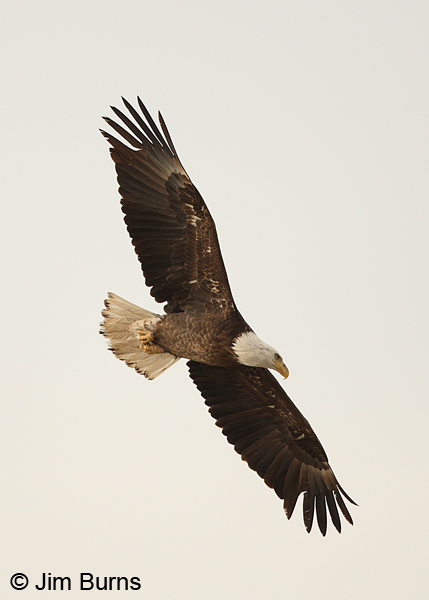 I have many images of eagles in flight--against blue sky, against mountains, all ages, pairs together, fish in talons, but I want a shot looking down on one, a dorsal image of an eagle in flight, river below it in the void. And I’ve often seen them perching below me on this bluff. Perhaps today. Far below at water level I see a flash of white. Something lands on a log at mid-river. Binoculars up, I see it is a Belted Kingfisher, something in its bill too far away to discern. I guess crayfish. I hear the shrill, three-note alarm of a Greater Yellowlegs protesting the kingfisher’s intrusion. Interesting that even at this remove I’ve heard the high call of the former but not the low rattle of the latter. Three boulders from my position a Rock Wren appears, voices its thin chip-trill, tinkling and dry as the desert surrounding us, then does a few of its signature bobs and commences to ply the stony debris for insects. Somewhere upstream a Coyote yips, inciting a brief chorus of replies. I see the Osprey first. I smile inwardly thinking it is an Eagle. Its wings are fully extended and flat, unflapping, and it appears so much larger than the second bird I see which is definitely a Red-tail. 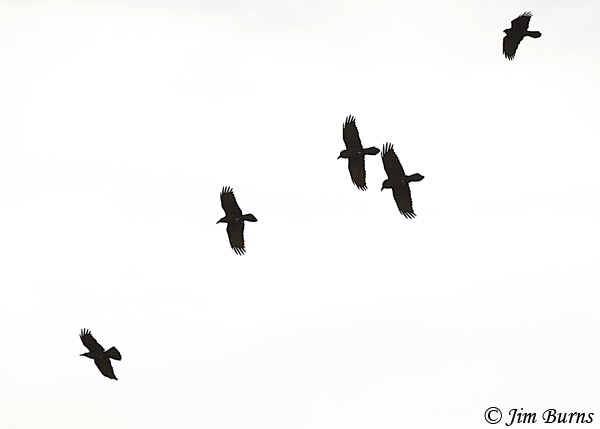 As they drift toward me and pass overhead, I realize my mistake and the reason for it. The Osprey is closer and much lower and the bright overcast, now victorious over the sun, is not helping with identifications. The smile remains though, despite the mistaken identity, because the two raptors are visual proof a thermal is rising up the cliff face. Osprey and Red-tail have come over high and from the direction of the distant mountains, perpendicular to the river’s course, silhouetted on the harsh, white sky behind them. My head is on a swivel now, watching 270 degrees, both high and low. In the image in my head the eagle is below my position, tracking along the ribbon of water. The river with its fish is, after all, why the eagles have taken up residency here. Nonetheless, a Bald Eagle coming from any direction at any height will trigger my eagle-in-flight addiction. Facing the river and watching downward, I hear the ravens before I see them. 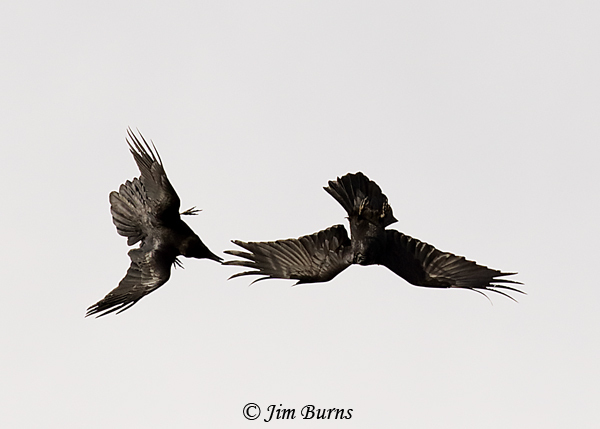 The vocal repertory of the Common Raven has been deemed “limitless,” and upwards of 30 categories of the species’ sounds have been catalogued. The one I first hear is the one most familiar to me, the deep, guttural croaking. I turn to the promontory of the cliff, looking directly into the brightest area of the overcast behind me, where the sun would be if it were out. 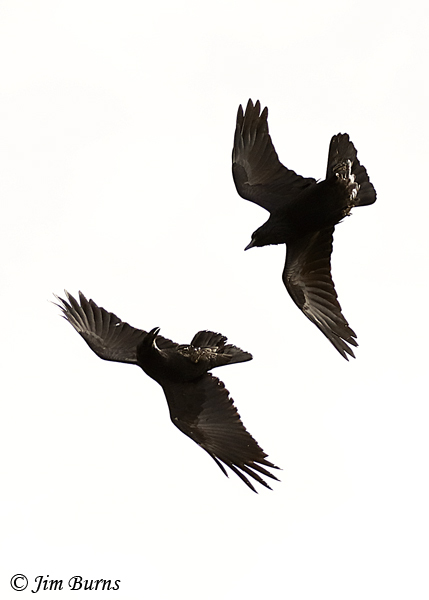 Multiple ravens, silhouetted, are boiling up over the ridge. From force of long and unexplained habit I begin counting, subconsciously knowing it will be easier to sort them as they clear the wall by ones and twos than after they break out over the river basin en masse. Fifteen. 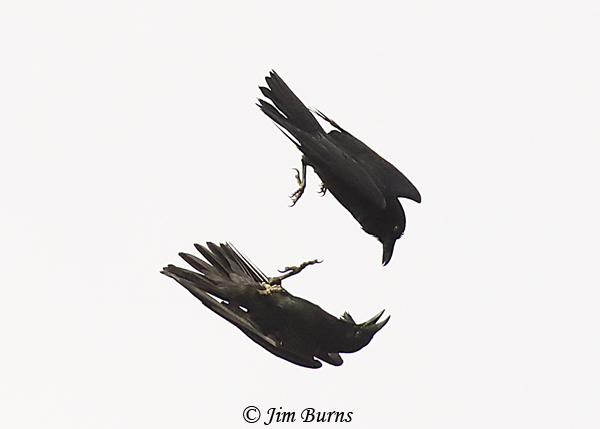 Undoubtedly you’ve heard the term “murder of crows.” Ravens together are called an “unkindness of ravens.” Regardless of the ancient origins of this sobriquet I’ve often thought it unseemly, for the groups of ravens I’ve encountered over a lifetime of birding have always appeared to be enjoying themselves, gamboling on the thermals, having fun. The show I am about to witness is unprecedented, unlike any other I’ve ever seen—ninety minutes(!) of constant aerobatics. Indeed, it is a rave of ravens. This is a river of ravens, flowing together, splitting apart, ebbing, surging, diverging and coalescing again, like the braided waters below them. They seem to be working in pairs, sometimes multiple pairs together in formation, though the pairings appear to be promiscuous, the formations ephemeral and amorphous. It is breathtaking! Free falling dives, steep ascents, one-wing tucks into loops, double-wing tucks into rolls, double loops, double rolls. I am exhausted, first by the sheer energy and length of the show, then by holding camera and lens up for minutes on end to capture something, anything, of this natural phenomenon. The action is spectacular, though the light is terrible for photography. I am seeing a black river of feather and bone flowing over a white canvas of cloud and ether, all the while accompanied by croaking, knocking, gurgling, and the whisper of wings in the wind: I see one grab another’s wing; I see another grab one’s talon; I see one carrying a large, white mushroom(!) being chased by three others—endlessly. Once as they swirl out over the river I notice, suddenly out of nowhere, a Bald Eagle is flying in their midst, neither the black river nor the dark raptor paying one another any mind. I manage only one frame of the eagle and realize, as camera and lens continue tracking upward to follow the billowing, boiling black spiral, I don’t care about the eagle right now! Ruefully I laugh to myself. 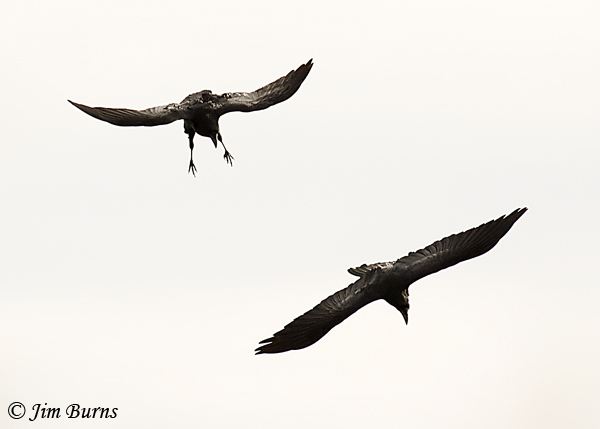 Every time the ravens fly off, nearly out of sight toward the distant wall of Granite Reef and I think the show is over, they reappear in the distance in a totally unexpected direction, black wraiths, returning again and again as if to recharge in the thermal over the cliff face behind me. I know “black wraith” is contradictory. I know eagle trumps raven. I can’t help myself. But finally they are gone. I wait, hopeful. They do not return. I glance at my watch. Ninety minutes, but it seems only a moment. That moment is gone. 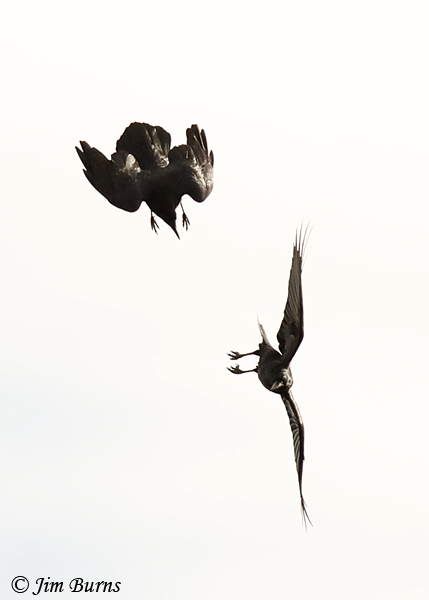 That in-the-moment trance where only the ravens, the camera, and I exist, is broken, has fled with the black, winged, feral river in the sky. I feel the chill from the breeze, the tightness in my legs from the climb, the regret that my eagle vision is still unrequited. Binoculars up one more time before I leave, I glass upstream and see a dark, distant speck soaring above the desert against the backdrop of Ord. As the raptor banks, I catch a flash of white, both fore and aft. I’ll be back.